In February 2017 our “Tete Oldendorff” (88,266 tdw, built at Imabari in 2006) entered Chengxi Shipyard in China to be converted to a transloader. 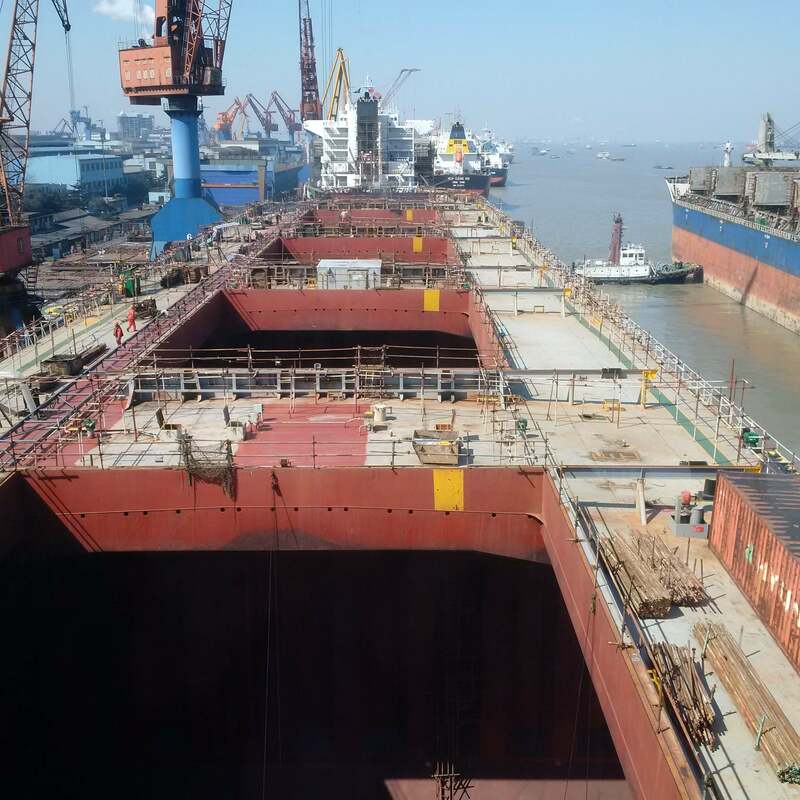 Chengxi Shipyard is located in Jiangyin City on the lower reaches of the Yangtze River, and is one of the largest shiprepair and newbuilding enterprises under CSSC. During the conversion period the “Tete Oldendorff” will be renamed “Anna Oldendorff”. The conversion is expected to be completed in the summer of 2017. The conversion process involves installing generators, 3 side mounted Liebherr MPG cranes on deck together with hoppers, conveyor belts and unloading booms. The superstructure will also be increased to accommodate an additional 16 persons. 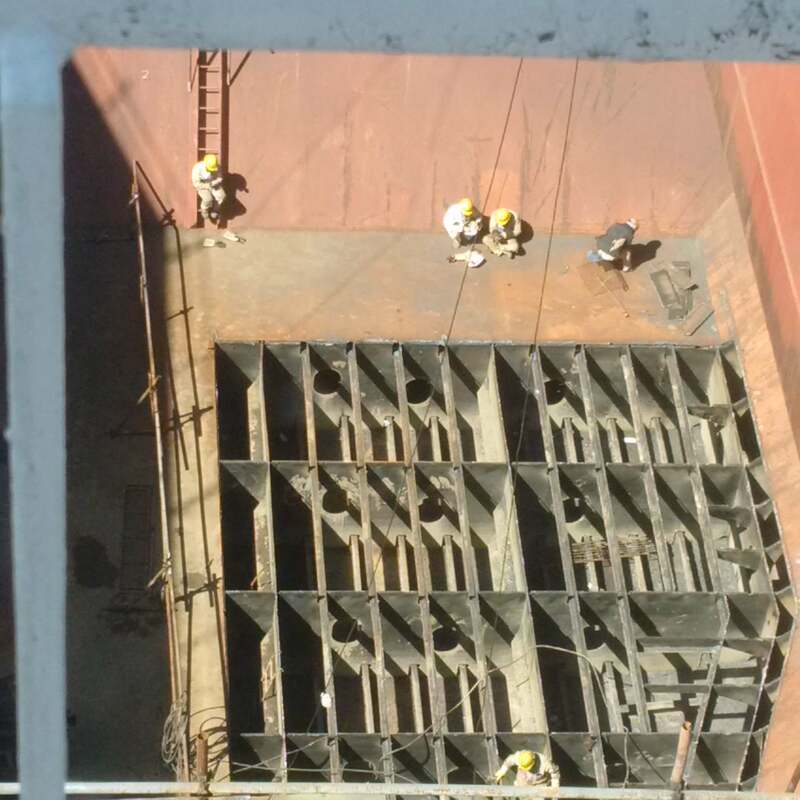 The conversion will add about 2,500 mt of new steel to the vessel. After conversion to a transloader “Anna Oldendorff” is scheduled to replace the “E. Oldendorff” and join the fleet of Oldendorff Carriers Transshipment L.L.C, in our Arabian Gulf transhipment operations. Since 2008 the “E. Oldendorff” (77,459 tdw) has been performing transhipment operations in the Arabian Gulf, primarily for Emirates Steel. Oldendorff has lightering and transhipment operations for iron ore in four countries in the Arabian Gulf: UAE, Saudi Arabia, Qatar and Bahrain. The new flexible design of the “Anna Oldendorff” will make her suitable for any of the Arabian Gulf operations. The Anna will work together with our “Johanna Oldendorff” and two purpose built transloaders “Alfred Oldendorff” and “Antonie Oldendorff” (94,000 tdw built 2015) lightering or fully unloading capesize bulk carriers in deep water in the Arabian Gulf. 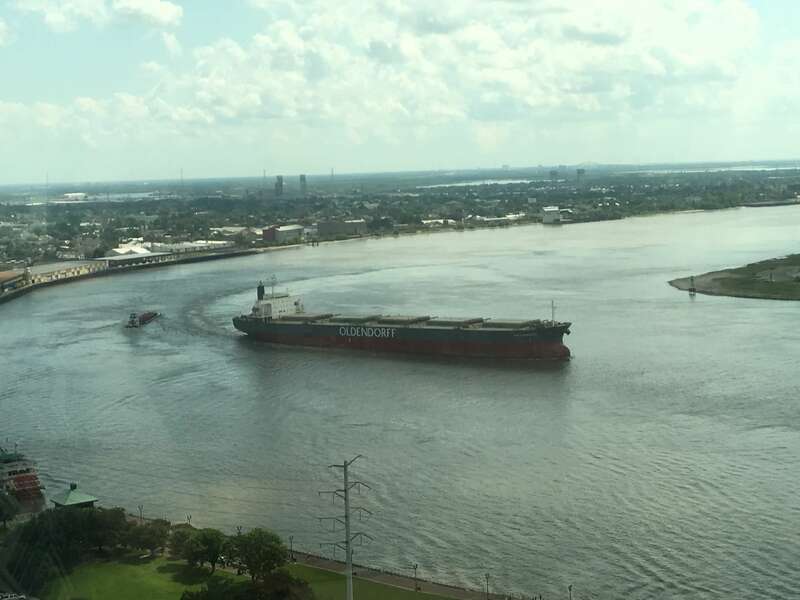 Under long-term CoA’s, Oldendorff transports iron ore from Brazil, Canada and Norway in Capesize vessels to an anchorage 22 Nm offshore Abu Dhabi. Any of our 3 transloaders can be used to unload the Capesize vessels offshore with their side-mounted cranes with hoppers, conveyors and boom. Four 13,400 tdw self-propelled, self unloading barges transport the ore 30 Nm from the offshore anchorage to the steel mill jetty in the Musaffah channel, where it is self-unloaded dust-free into the jetty hoppers. Oldendorff Transshipment also performs offshore lightering of iron ore for clients in Bahrain, Saudi Arabia and Qatar. In deep water, our Transloaders lighter 50 – 80,000 mt from Capesize bulk carriers. Both the Cape and the Transloader then proceed to the port with a restricted draft, where they unload the iron ore.
Oldendorff Carriers has also signed a contract with Chengxi Shipyard to install side mounted cranes on the “Trina Oldendorff” (75,053 tdw built 2013). Oldendorff and Chengxi have a long and strong relationship dating back more than 10 years on vessel conversions, culminating now in 5 projects. OLDENDORFF CARRIERS GmbH & Co. KG. OLDENDORFF CARRIERS (Singapore) Pte. Ltd.
OLDENDORFF CARRIERS Middle East Ltd.
OLDENDORFF CARRIERS GmbH & Co. KG - India Branch. OLDENDORFF CARRIERS Melbourne Pty Ltd.
Egon Oldendorff Verwaltungsgesellschaft mbH - Vancouver Branch. EGON OLDENDORFF GmbH & Co. KG - Shanghai Branch. OLDENDORFF CARRIERS Trinidad & Tobago Ltd.
İskolden Taşımacılık ve Ticaret A.Ş. Philip Heymans Alle 29, 2.th.